Callery pear, widely known by one of its cultivars, Bradford Pear, is a good example of how appearances can deceive. People crave blooms after a long winter, and callery pear comes through with its masses of radiant white flowers that look like someone turned on a giant 100 watt lightbulb in the landscape. Though it originally was thought not to spread, callery pear has been popping up along roadsides across the U.S., looking as if someone strung masses of Christmas tree lights along the highways. The visual effect is pleasing at a time of year when most of the native species are just coming out of dormancy and the landscape still looks otherwise drab. At that superficial level, which is how most people see the landscape, the callery pear seems an unmitigated blessing. People who plant it would seem to be doing everyone a favor, as the tree's beauty spreads far beyond the original planting. The specimens on Witherspoon Street in Princeton lift the spirits of passersby, and are celebrated as harbingers of spring by the local newspapers. At a deeper level--if you take a look underneath the ecological "hood", peak behind the visual soundbyte--you'll find the story is the complete opposite. 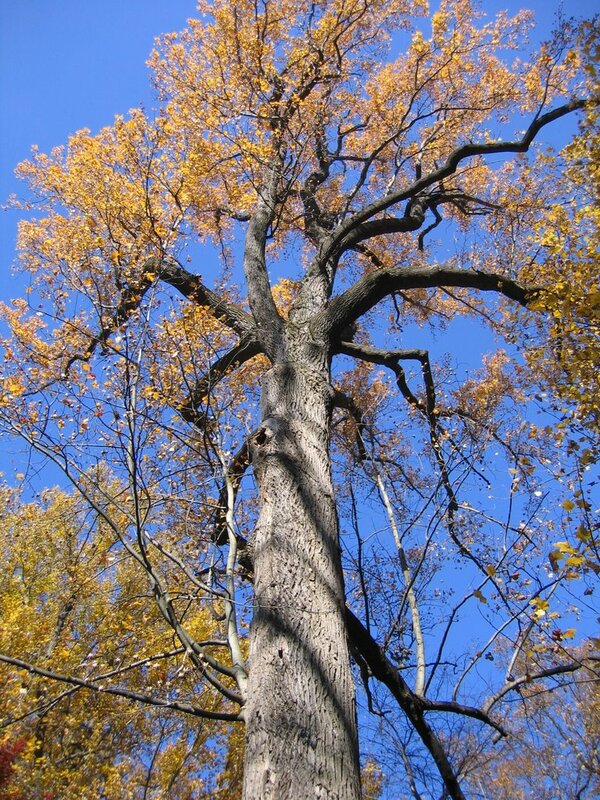 The rapidly proliferating callery pear poses a profound threat to America's landscape. Across the country, callery pear is spreading rapidly into forests and fields, displacing native species and steadily imposing a monotonous conformity. It was originally imported from China specifically for its adaptability to a wide variety of soil types and moisture and light levels, produces abundant fruit that starlings spread across the land, and so can quickly invade a broad spectrum of habitats. The website naturalbiodiversity.org calls it a "bio-bully". A county in Indiana suffering from an advanced stage of invasion calls the callery pear "a bad, bad plant with pretty flowers." This lovely flowering tree is like the celebrated town figure who, unbeknownst to the local citizenry, has been running a seedy operation on the outskirts of town. Just to be clear, aspersions are not being cast on all non-native plants. Whatever you think of the exotic forsythia (this imposing hedgerow runs parallel to the American elms along the Washington Road entry into Princeton), it has not become a menace to woodlands and fields. It may offer little to wildlife other than cover, but it stays where its planted. Callery pear, then, is a symbol of the time in which we live, when the present is in deep conflict with the future. This is a time when that which is much loved and enjoyed, and which appears on the surface to be completely benign, is quietly working beyond most people's awareness to dismantle our cherished inheritance. How does one convey this to people without seeming to be a killjoy? Such knowledge, by threatening our enjoyment of the world we've made, poses an emotional challenge that people are left largely unprepared to handle. Is there a way to still experience the simple pleasure of a callery pear's beauty while at the same time understanding that they collectively pose an extraordinary danger? The same challenge awaits anytime one climbs into an automobile, needing to get somewhere yet knowing that collectively the use of cars is destabilizing our climate. Some means of handling cognitive dissonance, preferably not complete denial, is necessary just to get through the day. Only by making these connections, and coping with the responsibility they imply, can towns like Princeton step out of a pleasant bubble and begin to question the way we unwittingly contribute to massive changes underway beyond our borders. As we collectively remake the world, there are other impediments to our understanding these connections between individual acts and collective impact. One is the notion that nature is in control, that if I plant an invasive species, anything it does after I plant it--spread into the neighbor's yard, or into the local preserves--is in nature's domain and not my fault. There is also the belief that nature will eventually mend itself--a capacity being severely tested. Perhaps the most interesting impediment is a skewed notion of what constitutes freedom. The increase in one freedom can lead to a precipitous drop in another. For instance, the freedom to buy and plant highly invasive species like callery pear essentially consigns the larger landscape to the tyranny of invasion, and deprives future generations of the freedom to enjoy the beauty of a diverse native woodland or field, and the wildlife that needs a diverse food supply to thrive. On a small scale, many of us are forced to deal with ongoing invasions of english ivy or bamboo from neighboring yards. What are the property rights of those being invaded? This is the less than lovely backstory on a lovely display of flowers on Witherspoon Street in April. 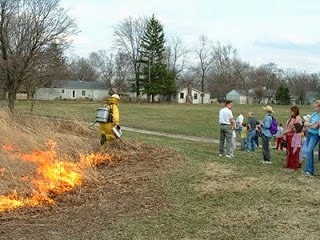 Note #1: For alternatives, google "native alternatives to callery pear". "Last week, the Midwest Invasive Plant Network held our first webinar on Invasive Plants in Trade. We had some technical difficulties at the beginning of the presentation, but we did manage to record Theresa Culley’s talk on Callery pear. The recording is now available at the following link: https://gomeet.itap.purdue.edu/p67o689ypt4/. After the first minute, the recording goes silent. Skip ahead to minute 15, and you’ll be able to hear the full presentation. Make sure your computer’s speakers are turned on to hear the audio portion." 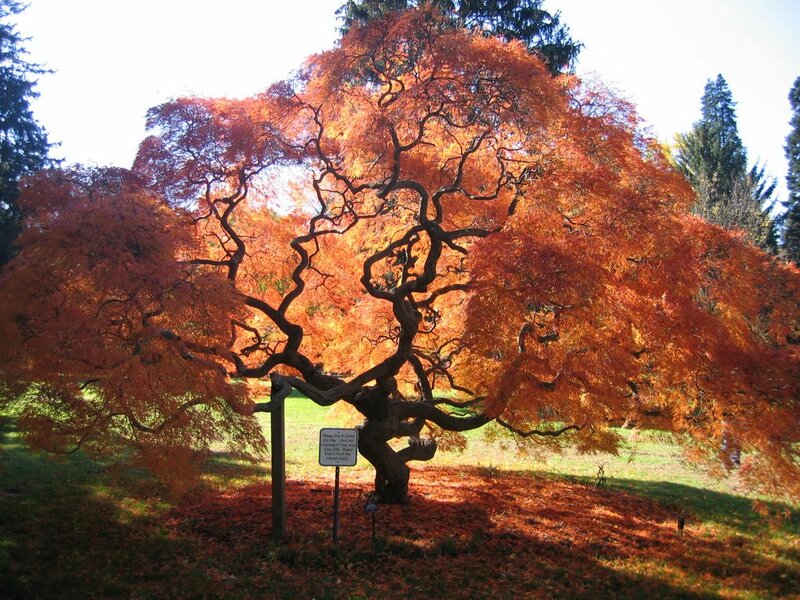 Today, April 27, Marquand Park's 60th year celebration, with a tour by the Macholds at noon, followed at around 1:30 with comments by town arborist Greg O'Neil and Mayor Lempert, and the planting of three native chestnuts. The park is located on Lovers Lane, between Mercer Street and 206. Check out some events the next town over in Kingston, at http://www.kingstongreenways.org/, including a May 7 annual meeting featuring a talk on Somerset County parks by Clifford Zink. Friends of Princeton Open Space is having its annual meeting Sunday, May 4, 3pm, at Mountain Lakes House, with Michele Byers as the guest speaker, refreshments, and a nature walk afterwards. Call to rsvp, 921-2772. Birders speak of a resurgence in birdlife at Princeton's Rogers Refuge (just down from the Institute Woods) since deer culling has allowed the spicebush to rebound in the understory. As a member of the Friends of Rogers Refuge, I wrote an ecological assessment and stewardship plan for this beautiful marsh and floodplain at the end of West Drive. The annual birdwalks there are scheduled for May 17 and 18, beginning at 8am at the fork in the road on West Drive. These and other walks in the region are listed at the Washington Crossing Audubon website. "Winnie and I will be leading a Birdathon walk there on May 10th. This is a fundraising event for WCAS, and the emphasis will be on broader participation, not just the number of birds sighted. For all of these events, all are welcome. A May 4 call for volunteers from Canal Watch, to help with the first spring planting of native plants at Bulls Island where the invasive Japanese Knotweed has been eliminated. I mention it not knowing any of the details about place and time, but sounds impressive anytime this transition from invasive to native can be made. Meanwhile, back at Marquand Park, here's a photo of the otherworldly threadleaf Japanese maple, its brilliant colors backlit by an afternoon sun, taken some years back before it was damaged in a storm. One of the prettier spots to take a walk in Princeton is Herrontown Wood, the original nature preserve from which all others in town followed. The parking lot is down a deadend street opposite the entrance to Smoyer Park on Snowden Lane. Though long blocked by fallen trees and invasive shrubs, the trails were reopened last summer and fall by Kurt and Sally of the Friends of Herrontown Wood. They continue to work to improve the trails where the many rivulets of spring runoff cross. and skunk cabbage makes ribbons of green where floodplains broaden. and a few patches of Rue-anemone survive along the trail edges. With most native woody plants just beginning to come out of dormancy, the cliff is still visible from a distance. The "second forest" of non-native shrubs--mostly privet, multiflora rose and winged euonymus--is casting a diffuse green. The early greening of the non-natives has the unfortunate effect of casting shade on the native spring ephemeral flowers that need the spring sunlight to gather enough energy for the next year's growth. 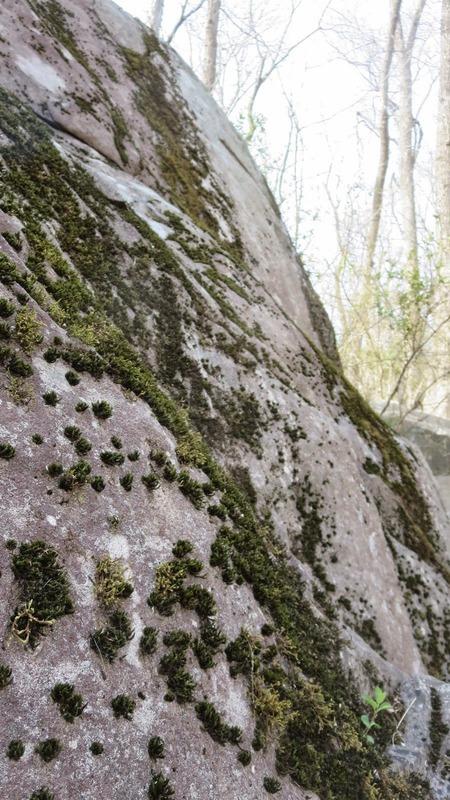 Mosses decorate the boulders with their infinite patterns. One thing that needed tending to was the propping up of one of the few specimens of native hearts a'burstin' (Euonymus americana) in Princeton. 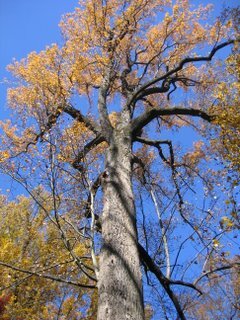 It's a favorite food of deer, but this specimen has survived because it is too tall for the deer to reach. Propping up will allow it to flower and set seed this fall. If only the deer would eat the many thousands of exotic winged Euonymus that clog portions of the park, there wouldn't be such an imbalance. But the wildlife's tastes don't seem to adapt to consume the introduced species. 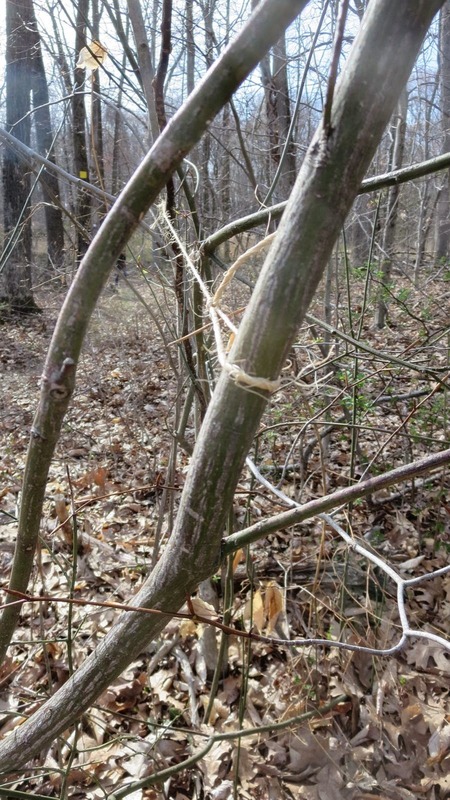 At least the many exotic shrubs have helped out in one instance: We just found another hearts a'burstin' this past week, whose survival owes in part to the dense surrounding growth of exotic privet that has likely prevented the deer from discovering it. On a recent outing, I met a woman with a beautiful reddish dog named Fred, whose high level of alertness suggested a closer connection than usual with ancestral wolves. As we talked, we heard birdcalls down the hill that later turned out to be three pileated woodpeckers. This could be said to be where open space preservation began in Princeton, at the 1870s farmhouse that the famous mathematician Oswald Veblen bought in the 1930s for his study, on land he and his wife Elizabeth would later donate to the county as Herrontown Wood. The time came last week to move the chicken coop to the back of the property so that we could start beautifying the patio next to the house. The move came after months of careful planning and procrastination. The project was a good opportunity to use some of that used lumber scavenged from the local curbside kmart over the years. The chickens came over to check on progress, and to look for any grubs my large mammal activity might have stirred up. Fortunately, the former owners had fashioned a platform of concrete blocks, used 50 years ago for a rabbit hutch. We are simply carrying on an agrarian and can-do/do-it-yourself tradition established by the original owners. With serendipity as my co-pilot, I found that the pieces of the old coop could easily be unscrewed from each other and fit very well in the new location. Even with serendipity, it took a couple days to make all the old coop parts fit together in a new configuration. It helped that the repurposed skylights didn't fall over and break, despite multiple close calls. Natural light is important in a coop, especially during winter when the chickens tend to stop laying if daylight isn't sufficient. With most projects like this, there's a magical moment when the new space becomes real, when the end comes suddenly into sight, and all the hours spent feel worthwhile. Now all it needs is a few boards screwed over the openings, to keep any night predators out. With some interior decorating, what fowl could resist? Well, the chickens and ducks were so habituated to the old coop that we had to carry them over to the new one each evening. After the third or fourth night, they finally bonded with the new coop and made the journey themselves. There's been a call for a coat of paint, though the weathered look has its charms. Now, if we could only convince Buttons to lay in the coop, rather than hiding her eggs behind the hay pile. Sometimes we think one or another fowl has stopped laying, only to find a surprise somewhere in the yard after several weeks. What to do on a birthday? Wanting something more spiritual than material, we decided last month to climb a mountain. The best day to go turned out not to be my birthday but my sister Anne's, who had lost a battle with pancreatic cancer a couple years back. She loved mountains, and had climbed a few in her lifetime, the biggest being a figurative one--making it in the man's world of polymer chemistry. Towards the end of her career, she received a large grant to start an institute whose mission was in part to bring more women into the sciences. She loved gardens, modern art, and hard work, and took the long view--all good reasons to spend her birthday climbing a mountainside, with patches of dormant mountain laurel and blueberries telling of past bounty and future promise, and panoramic views to open our minds up wide. In New Jersey, there are several mountains to choose from. Baldpate Mountain and the Sourlands close by, and High Point among others to the north. Pyramid Mountain with its improbable Tripod Rock sounded interesting, but we were warned the trails remained treacherous with ice. We ended up choosing Mount Tammany because it has the greatest rise, the steepest climb and the ranger thought the trails would be passable. Even though well trod, there was enough snow and ice remaining that we had to step from rock to rock to get traction. Last year's seedheads still hung on the mountain laurels. If enough people gazed out upon a view like this, with one ridge giving way to another, on and on into the mist of infinity, America might take more interest in its shared future. After climbing up on the red trail, we took the blue trail over the ridge and down the other side, through a giant blueberry patch beneath an open canopy of oaks. I imagine that shade-grown coffee bears its fruit in a similarly filtered light in central America. The hike down could have been treacherous if not for soft snow that gave more traction along the edges. On the hardened snow of the trail, finding a safe place to step required keeping an eye on the snow. Subtle variations in the light reflecting off the frozen surfaces hinted which snow would be the least slippery. Somehow during the descent, with each step requiring quick decisions, I found time to speculate on whether this ancient honing of eyesight for the sake of survival finds modern application in the appreciation of how light plays on a canvas or a photograph. Linear etchings in the rock suggested past presence of glaciers. One of the blue trail's rewards is a beautiful stream leading down a valley to the parking area. Here's a good natural representation of what in stream restoration is called a cross vein. The rocks, shaped like a "V" pointing upstream, focus the water's flow inwards to create a scouring action that over time scours out a deep pool. Constructed examples of this can be found in Princeton University's stream restoration just down the hill from the new chemistry building. Icicles of many shapes decorated the streambank, like frozen tears suspended above the water's flow. I've been known to bring readers the "inside story" on recycling, to show which recycling bin designs work, and which only make it more likely that people will mix trash and recyclables by throwing whatever wherever. The best evidence of how a recycling bin is performing is inside the bins themselves. Photos and commentary ended up occupying their own blog, http://recyclingcontainers.blogspot.com/, with samples from Princeton and around the world. When it comes to the contents of trash cans, I leave the research to others, like this raccoon at the Dinky Station, who clearly agrees that the inside of a trash container tells a story, and an edible one at that. The raccoon's research may never get published, but in the meantime the raccoon's doing its part to reduce the amount of foodwaste headed to the landfill. I got a lot of comments on this letter to the editor, which appeared a couple weeks ago in two local papers. Even if March finally brings relief from winter’s chill, this spring is sending a shiver down my spine. March is when the monarch butterflies take wing from their small forest enclave in the mountains of Mexico. Their numbers have been dwindling. Since the first count in the 1990s, the overwintering population of monarchs, clustered together on dense evergreen trees, has shrunk from a high of 50 acres down to a mere 1.5 acres of the forest this winter. As the monarchs begin their annual flight north, they have the reproductive capacity to rebound, but they face ever tougher odds. The monarchs’ fate is literally up in the air. There’s the herbicide that again will be sprayed on more than 150 million acres of Monsanto’s “Roundup Ready” corn in the midwest. Back when tillage was used for weed control, farm fields doubled as pretty good habitat for monarchs. Now, the intense spraying of herbicide-tolerant corn and soybeans has largely exterminated the milkweed the monarch caterpillars cannot survive without. Also airborne are ever greater numbers of carbon dioxide molecules, drivers of the global weirding that buffets wildlife with increasing extremes of drought, heat and cold. And there’s the political hot air that spawned an irrational subsidy of ethanol production, which since 2007 has motivated farmers to plow up prairie and roadsides to grow more corn and thereby reduce monarch habitat even more. Since the ethanol produced barely equals the energy required to grow the crops, any societal benefit is dwarfed by the vast loss of habitat in the country's heartland. Precious few monarchs visited Princeton last year. MonarchWatch.org details the conditions that could allow them to rebound to some extent. But the worry is that, like the passenger pigeons that disappeared early in the previous century, monarchs may need a critical mass to sustain their miraculous migration. Other than supporting national efforts to restore habitat, and reducing our fossil fuel consumption from gulps down to sips, we can seek to be optimal hosts to whatever monarchs reach our backyards. If you have some sunlit areas, DR Greenway and the farmers market are sources for native milkweed species. In my role as a local naturalist, I collected seeds of local genotypes of milkweed last year and plan to grow and share as many as I can. In a world so focused on extraction and consumption, it will take years of effort, advocacy and luck just to keep what we’ve always taken for granted, and to warm up again the feeling of spring. Note: The Nature Conservancy blog offers some background information on the monarchs' migration, here and here, and the NRDC has a letter writing campaign aimed at the EPA. Even though it seems like spring just started, the window of opportunity for buying chicks to grow as backyard egg layers and pets is quickly closing. They need enough time to grow up before cold weather comes. We bought our chicks two years ago at Rosedale Mills in Pennington, and get our feed either there or at the Belle Mead Coop up 206. Rosedale Mills told me they have a wide variety of chicks right now, and are expecting one last additional batch of chicks to arrive in a couple weeks. The legality of having chickens in Princeton has been disputed, but I researched it and learned that it is considered legal as long as the neighbors don't mind. Our chickens (no rooster needed) have been very quiet, and though the two ducks we have speak up now and then, the neighbors say they enjoy the sound. Pre-made coops can be pricey, but a coop makes a nice project to fashion out of spare wood. You can find lots of posts on this blog about the chickens and ducks we have, by typing "chickens" into the search box, which gets you this group of posts. Our Aracana chickens each produce an egg every day or two, are very approachable and holdable, need no supplementary heat in the winter, and get the run of the fenced-in backyard during the day. Read various posts here and abundantly elsewhere online to familiarize yourself with issues like hawks. The ducklings came via the mail from California. They are messier birds than the chickens, but are real characters, and lay even more eggs than the chickens. Duck eggs, with their larger yolks and somewhat drier characteristics, are handy for baking. Most people keep their chickens in a fully enclosed run, but we find letting them all run free is worth the risk, particularly when we have a "guard duck" of the Pekin variety that seems to intimidate the hawks. Care is a matter of keeping them in food and water, closing them in at night, cleaning the coop regularly, and retrieving the eggs. Jenny Price, a visiting environmental historian, activist and writer at the Princeton Environmental Institute, sent me these links to upcoming talks she'll be a part of. A couple years ago, I realized that humor might help engage more people in environmental issues, and began writing tragicomic scripts having to do with climate change. It was also a matter of having put serious time into a lot of environmental projects, and feeling a need to have some fun. I contacted Jenny when I noticed she's teaching a course at PEI about humor and the environment. Note in particular the "That's Not Funny" event, whose link includes more about Jenny's work. Event about NJ coastal resilience. Tree casts shadow of snow. And a not so funny one.